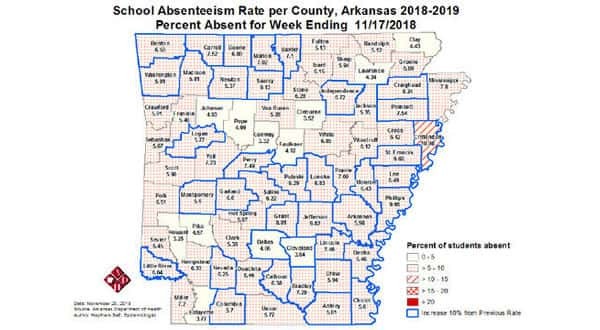 A new report from the Arkansas Department of Health on influenza for the year to date shows absenteeism at schools in Baxter, Boone, Marion, Newton and Searcy counties, while not epidemic, is higher than the previous week. During the flu season, the ADH produces a Weekly Influenza Report for clinicians. The report provides information on flu activity in the state. The report also compares influenza like illness in Arkansas to activity in the U.S. ADH receives reports of only a fraction of flu cases. Therefore, it is important to understand the information in the weekly update is representative of the timing and location of activity, but it does not reflect the overall burden of disease. It is presumed there are many more people actually affected than the report shows.  The state average school absenteeism rate last week was 6.7 percent among public schools. The absentee rates in Baxter, Boone, Marion and Searcy counties were all above that level. Newton County's absentee rate was below the state average, but all five counties showed a 10-percent increase in absenteeism from the previous week.  For Week 46, Arkansas reported sporadic activity to the Centers for Disease Control and Prevention for geographic spread of influenza, and minimal or 3/10 for ILI intensity.  Since Sept. 30th, over 900 positive influenza tests have been reported to the ADH online database by health care providers.  Among flu antigen tests that can distinguish between influenza A and B virus types, 67 percent were influenza A, and 33 percent were influenza B.  There are 18 positive PCR flu tests this week from private labs: 10 tested positive for influenza A, six tested positive for influenza B, and two samples tested positive for both influenza A and B. At the ADH lab, four samples tested negative this week.  About 2.2 percent of patients visiting emergency rooms this week were there for ILI. About 2.6 percent of outpatient visits were for ILI.  To date, three influenza-related deaths have been reported in Arkansas this flu season. CDC has reported the second pediatric death nationwide this season.  No reports of influenza outbreaks were reported from nursing homes or other facilities this season.  The proportion of deaths reported to the National Center for Health Statistics attributed to pneumonia and influenza (P&I) was below the system-specific epidemic threshold. You can visit www.healthy.arkansas.gov/programs-services/topics/influenza AR flu report to report flu year-round.